That’s the signpost up ahead—your next stop, the Twilight Zone. This was anthology type sci-fi series which featured a different plot line and cast for every episode. Episodes typically dealt with regular people who through some twist of fate find themselves in some sort of supernatural or alien situation. They could be scary or thought provoking and almost always had an unexpected twist in the end. The stories always had a moral lesson (at least by the end of the episode) and some dealt with topical social issues. The Twilight Zone was a first of its kind. It re-created the sci-fi / horror genre by including fantasy / psychological thriller into the mix. These were not just scripts for tv this was storytelling at its finest. Each episode easily stood on its own as a piece of history and these diverse stories became cult classics. 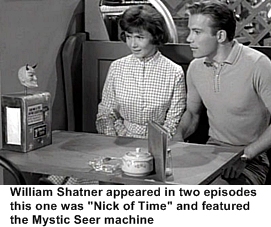 During season 4 the show was suddenly replaced with an hour long show then that show didn’t make it and the network asked Twilight Zone to return as an hour long program. This necessitated the rewriting of the scripts and refilming of the episodes that had been completed. The episodes were written to be mini-movies, to play out over the 25 minutes of a 1/2 hour time slot and stretching them really hurt the quality. The next season they returned to the 1/2 hour format. Falling ratings and rising costs doomed the show at the end of its fifth season. Serling did not venture back into the supernatural until 1970 when he was invited to host and co-write a new series called Night Gallery.